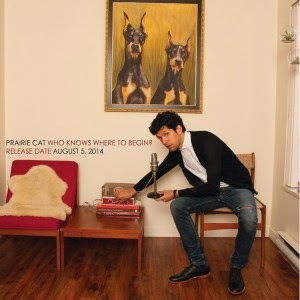 It's been five years since we had new music from BC's Prairie Cat. This week he broke his silence with the release of the new album Who Knows Where To Begin? The record is a collection of melodic and light indie pop songs that don't take themselves too seriously. Part Magnetic Fields, part Apples In Stereo, part Leonard Cohen, Prairie Cat is all unique. The tone gets set by the title track, which leads off the album. Featuring a music box introduction, it uses sunny percussion to create a quirky, cute feeling. Most of the tracks are light and laid back. "Got Nothin'" and "No Bedroom" take that approach and fill in their sound with programmed drums, piano, keyboard, and other analog elements. Prairie Cat can get peppy too though. His channeling a far less annoying version of Len on "Beautiful Baby" is a case in point. On "Upright Beast", Prairie Cat's vocals have a vague Kermit The Frog sound to them. Trust me, it sounds better than the description. Much like this review however, Who Knows Where To Begin? is a pretty thin record. It's fun and enjoyable, but in an entirely fluffy kind of way. Best tracks: "Upright Beast", "Beautiful Baby"